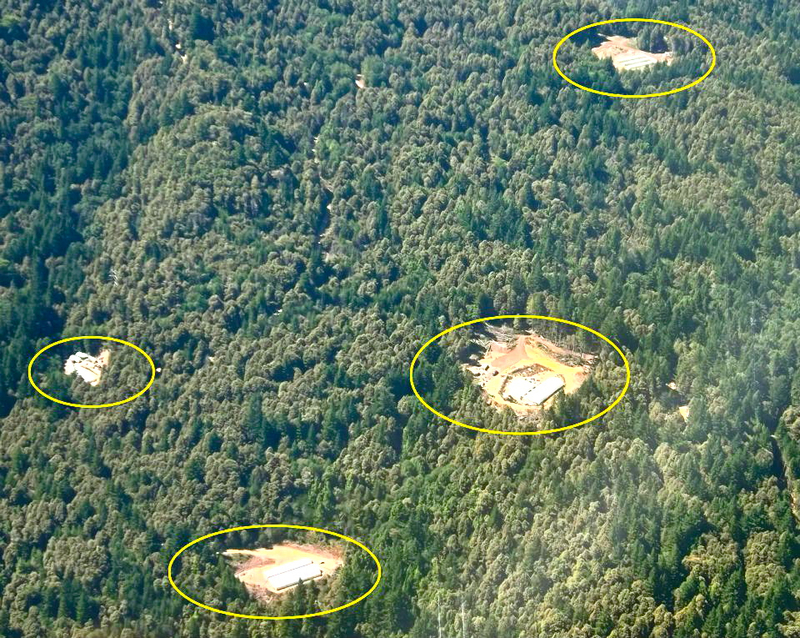 Aerial photos taken by Superivsor Mark Lovelace last year show cannabis-related clearcuts throughout remote wooded areas of Humbboldt County. HUMBOLDT – Environmentally harmful marijuana production has again been documented, this time before the North Coast Regional Water Quality Control Board, and a state official has estimated that it will cost between $3 million and $5 million a year to pay for additional staff to crack down on it. There’s been a surge in awareness of large-scale grow impacts in Northern California and a panel presentation put the issue on the water board’s radar at its May 2 meeting at Eureka’s Wharfinger Building. Stormer Feiler, a water board environmental scientist, used a series of photographs to reveal watershed damage that was described as “shocking” by board members and panelists. There’s consensus that more enforcement is needed to respond to the sometimes outrageous destruction being wrought in sensitive watersheds but federal help is limited and it will be expensive for the state to beef up its response. Feiler said there’s been an “exponential increase” in the numbers of rural and wilderness grow sites. Many are being recklessly developed and “organized criminal relationships” are apparent, he continued. The bad practices include grading of forested areas, illegal road construction without drainage, fertilizer and pesticide runoff, spills of oils and fuels, harmful fill depositing, high volume water diversion and wildlife poisoning. 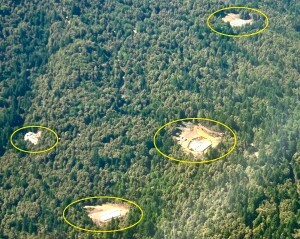 Detailing cases that have resulted in prosecution in Mendocino County, Feiler showed photos of large-scale grading that “completely filled three streams” with soil, “obliterating them.” In another case, a property owner excavated about 20,000 cubic yards of earth and debris and resisted a $423,000 clean-up and abatement bill by declaring bankruptcy, he said. A case of “recreational bulldozing” was also documented as Feiler displayed a photo of a small dozer stuck in a stream channel. It was identified as having been stolen and a prosecution for grand theft was carried out. Photos of emptied chemical containers, rickety diesel rigs, muddied streams and denuded riparian areas followed. Brad Job of the Bureau of Land Management’s Arcata office said water diversion and other impacts are also being seen on public lands and he told the board he’d “bet my next paycheck” that phosphorous run-off from grows is the cause of blue-green algae blooms in the Eel River. 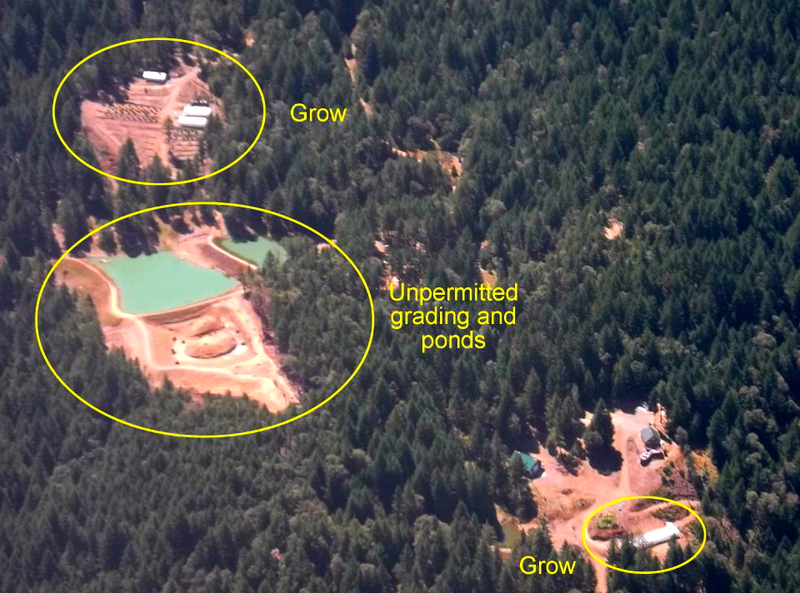 Job described a case of illegal grading and excavation that was referred to the U.S. Attorney’s Office, which declined to prosecute. Showing a photo of a shoddy-looking diesel generator and fuel storage set-up on privately-owned property, he told boardmembers that profit is being made from fuel deliveries and that the water board has the legal authority to intervene. Similar presentations have been made across the region and to those who have been at them or read news reports on them, none of it is unfamiliar. Water board members seemed aghast, though, and when they asked what their agency can do to help, Jeanette Pederson of the California Department of Forestry and Fire Protection said funding more enforcement staff is necessary. It would be a substantial investment. After saying that “the green rush is on,” Scott Bauer of the state’s Department of Fish and Wildlife estimated it will take up to $5 million to pay for more enforcement. He had given a presentation on a study he worked on that identified grows in Humboldt’s Redwood Creek and Salmon Creek watersheds using Google Earth and about 1,100 grows were mapped. A conservative estimate would put combined water use in the two areas at about 34 million gallons of water per growing season, Bauer said. Boardmember Irene Tynes told him that his documentation is a call for action. “The thing that clearly said, ‘I have a responsibility’ was that you proved to me, in two watersheds, that this is happening,” she said, adding that documentation is useful because “we need to prove to other lawmakers that something has to be done. The state needs assistance to combat a problem that Feiler said is “exceeding our ability to respond.” There was talk of asking the federal government to do more but Tim Broadman, an enforcement agent with the National Oceanic and Atmospheric Administration, has doubts about that. Boardmember Heidi Harris lives in western Trinity County and she said there’s an “absolute culture conflict” between growers and other community residents. But a distinction was made between growers who are known to their neighbors and those who are connected to organized crime or have criminal mentalities. “You’re not seeing what we are trying to tell you – how they go about conducting their business from day to day, week to week, month to month does not follow any kind of laws and regulations,” Broadman said. But the ones who are filling in stream beds aren’t coaching baseball. “If they’re members of the community, you probably have a chance but the problem is, these are not members of anybody’s community,” Massey said. “That’s right,” said someone in the audience. This entry was posted on Wednesday, May 8th, 2013 at 10:57 am	and is filed under News, Environment. You can follow any responses to this entry through the RSS 2.0 feed.